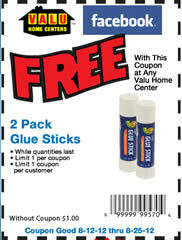 2 Free Glue Sticks at Valu Home Centers! Bring this coupon to your local Valu Home Center to score a free 2-pack of glue sticks! Expires 8/25/12.